Metallica today announced that they will reissue their third album, Master of Puppets on November 10th on their own Blackened Recordings. The album has been remastered for the most advanced sound quality and will be available in various digital and physical configurations. 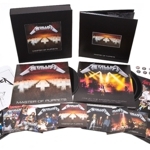 The reissue is available for pre-order beginning today at www.metallica.com where fans can see the full package details and track listing. Those who pre-order the standard album will receive an instant download of "Disposable Heroes (Remastered)". Those who pre-order the expanded or deluxe editions will receive an instant download of "Disposable Heroes (Remastered)" and "The Thing That Should Not Be (Live at the Aragon Ballroom, Chicago, IL - May 25th, 1986)". 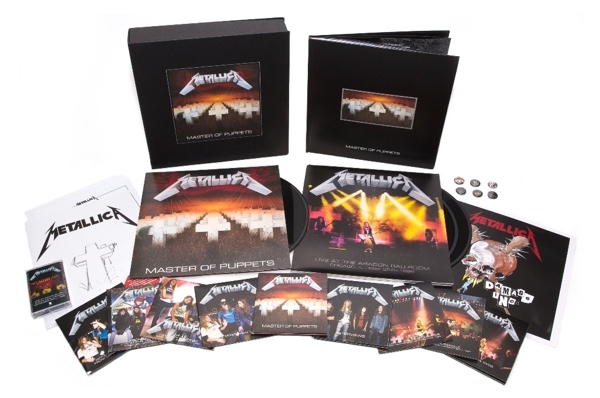 The Master of Puppets reissue will be available physically as a Standard LP, Standard CD, 3 CD Expanded Edition, and Limited Edition Deluxe Box Set and digitally as a Standard CD (available to stream and download), a 3 CD Expanded Edition (available for download only), and a Digital Deluxe Box Set (available for streaming and download). The Expanded Edition will include previously unreleased demos, rough mixes, interviews, live tracks, and a 28-page booklet. The Limited Edition Deluxe Box Set will include a 108-page hardcover book including never before seen photos, outtakes and previously unreleased interviews, three LPs, ten CDs, a cassette, two DVDs, a lithograph, a folder with handwritten lyrics, and a set of six buttons. Click HERE to watch James Hetfield unbox the reissue. Master of Puppets was originally released on March 3rd, 1986, via Music For Nations and went on to become the first Metallica album to be certified Platinum by the RIAA. The album has been certified 6x Platinum in the United States and has sold over 10 million copies worldwide. In 2016, the album became the first metal album to be added to the National Recording Registry of the Library of Congress, an honor granted to works deemed "culturally, historically, or aesthetically significant". Metallica are bringing their WorldWired tour to Europe, see below for their forthcoming UK tour dates.